Pont du Gard, translated as Gard Bridge is an ancient Roman aqueduct that crosses Gardon River in Vers-Pont-du-Gard, Gard Department. The bridge is part of the larger 31 miles long Nimes Aqueduct that was built by the Romans to carry water from the spring of Uzes to the Nemauses Roman Colony. Due to the hilly terrain, a part of the aqueduct was built underground, navigating a circuitous route up to the crossing of the gorge of Gardon. Here is where a bridge was required. The bridge was built in the 1st century AD and boasts the tag of being the highest of all the Roman aqueduct bridges. Along with the Aqueduct if Segovia, it is the best preserved Roman aqueduct bridge. Due to its historical importance, it was inscribed into the UNESCO World Heritage Sites in 1985. The bridge consists of 3-tier arches all standing to a height of 160 feet. It descends about 56 feet on its entire length, while the bridge’s gradient is 1:3000, indicative of the Roman precision in using simple technology to their advantage. At the height of its use, it carried about 200,000 cubic meters of water to the baths and homes of the Nimes citizens. However due to lack of maintenance, it would fall in capacity due to clogging by mineral deposits inside the aqueduct. It was used up to the 6th century. 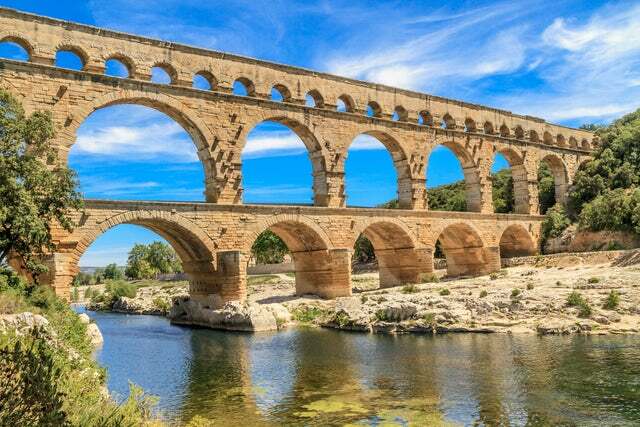 After the Roman Empire collapse, the aqueduct remained in disuse, but the bridge remained largely intact due to its functions as a toll bridge. The local bishops and lords were responsible for its maintenance and in exchange, they would charge a toll on all those who used it. It was not until the 17th century that the bridge fell into disrepair due to looting of stones. The bridge underwent a restoration in the 18th and 21st century. All the traffic and buildings were removed from the bridge and its immediate surrounding by the French officials. Today, it is one of the most popular destinations in France, attracting both literary and artistic visitors. It also has a visitor center. Be one of these visitors and you will never regret.